Alastair Cook's first home match as England one-day captain began with a 110-run win (D/L method) over Sri Lanka at The Oval in the first of five ODIs. After a three-hour rain delay reduced the game to 32 overs-a-side, Craig Kieswetter (61) and Eoin Morgan (45) led the charge in England's 229-8. 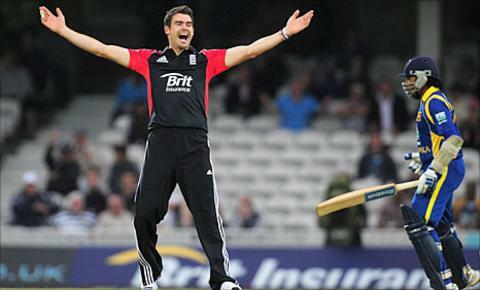 James Anderson (4-18) then tore into Sri Lanka's top order, reducing them to 15-4, and he also took two catches. Graeme Swann (3-18) cleaned up the tail as Sri Lanka were all out for 110. The thumping victory extended Cook's 100% winning record as England one-day skipper to 4-0 after three wins as stand-in captain during last year's tour to Bangladesh. His role with the bat was minimal - dismissed for only five - but he managed his bowlers with quiet efficiency, although the match was effectively won inside the first five overs of Sri Lanka's innings. Their lacklustre batting effort was not what Sanath Jayasuriya would have wished in his final international appearance for his country, arranged at the behest of the government he now represents in parliament. After 13,428 one-day runs, the left-hander only added two to his tally in his 445th international, although his return to the pavilion was accompanied by a fitting tribute after a 22-year Sri Lanka career. The tourists welcomed back captain Tillakaratne Dilshan, fully recovered after breaking a thumb in the Lord's Test, and he opted to bowl first in humid conditions complemented by threatening, overcast grey skies. England welcomed back Anderson and Jonathan Trott, who both missed the Twenty20 demolition in Bristol on Saturday, while Surrey fast bowler Jade Dernbach was handed his one-day debut at his home ground. However, just seven overs were possible before a spectactular thunderstorm, and the inevitable downpour which followed, halted play for nearly three hours. England had lost Cook in that time, caught behind feathering a faint edge chasing a wide ball down leg side in the third over. When play eventually resumed, England lost the obdurate Trott for 23, lbw to Suranga Lakmal, bringing Kevin Pietersen to the crease. The former captain, alongside Kieswetter, scored at a healthy rate, combining lusty hitting with intelligent running, although Pietersen survived a very close run-out attempt on 25 in the 16th over. His reprieve was brief when he clattered leg-spinner Jeevan Mendis' first delivery - a long-hop - to midwicket, where a grateful Dilshan clung on. New-man Morgan launched into his repertoire of extravagant strokeplay, unleashing the reverse sweep and his unique "change-up" stroke against the double spin attack. Kieswetter brought up his half century with an imperious straight six, high into the Members' stand, but a thick top-edged sweep off off-spinner Suraj Randiv and into Lakmal's hands curtailed his promising 56-ball innings. Morgan continued the onslaught, punishing Jayasuriya in particular and looked set for a half century, but his attempts to bring up his 50 with a six were thwarted when he guided Lakmal to Thilina Kandamby at long-off at the start of the 26th over. Ian Bell became Jayasuriya's 323rd - and final - one-day victim when he was adjudged lbw sweeping a straight delivery. But Bresnan and England Twenty20 captain Stuart Broad gave the innings late impetus with a stand of 47 in 31 deliveries and a decent target to defend. England set about their task with relish as Anderson, dropped from the team during the World Cup, removed Dilshan in the first over. Then Jayasuriya's one-day career ended rather anti-climatically when he drilled a poor delivery from Bresnan to Eoin Morgan at backward point, shaking his head as he walked off to a standing ovation. The tourists' early troubles turned into a full-blown crisis at 15-4 when Mahela Jaywardene and Kumar Sangakkara were dismissed within four deliveries by the rampant Anderson in the fifth over, the former trapped leg before and the latter chipping a simple catch back to the bowler. The Duckworth/Lewis target became unobtainable when, at 40-5, Dernbach earned his first one-day wicket courtesy of a brilliant outstretched catch at midwicket by James Anderson in the 12th over when Angelo Mathews misjudged a short delivery. Wickets fell at regular intervals before lusty late-order hitting from Lasith Malinga (26) and Randiv (24) took Sri Lanka beyond their lowest one-day total against England - 99 all out at Perth in 1999 - but Swann removed both with five overs to spare to wrap up the victory.